I have always been a fan of all of the Lego Star Wars sets. The greatest of these sets being the Ultimate Collector's Series. Episode V: Empire Strikes Back has also been one of my favorite story lines in the Star Wars Franchise. 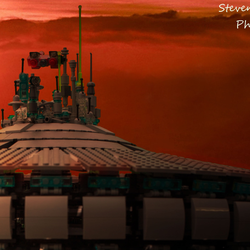 A series of sets that has only been explored minimally in Lego sets, has been Cloud City Bespin. I wanted to submit my vision for the Ultimate Collector's set of this great setting within the Star Wars universe. One of the most difficult challenges with creating Cloud City, is capturing the full scope of the space station without sacrificing stability and keeping the parts count down as much as possible. This is my initial attempt at adapting this grand structure into a Lego set. The top section of the set can rotate as well as the main disc of the city (see pic 5). There is also plenty of room inside the center of the set to add up to four (4) scenes from Episode V. The set would be well suited for several of the already existing micro scale Star Wars ship builds. You can see in several of the photos such ships displayed, including Slave I, Millennium Falcon, and a Cloud Car. 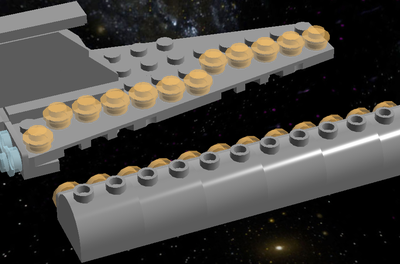 I am unsure of the exact brick count, as this was built slowly over the past year. 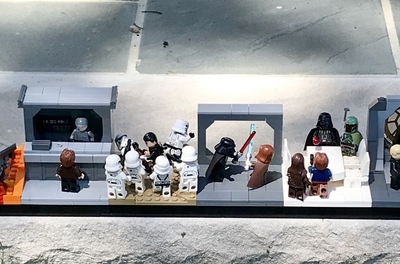 Through 3rd party brick seller's, I was able to purchase all pieces needed (as I had no Lego collection prior to this build) for under the current retail price of several Star Wars UCC sets. This gives me strong hopes for this set being able to be produced officially by Lego with in a price range to allow it to be affordable for any fan of this type of Lego set. There are several other challenges to meet with this set. In hopes to capture most of the desires for a set such as this from the community, if there is any adjustments, changes, or additions you would like to see made to this set feel free to let me know. I will try to accommodate as many requests as possible. If there is any further information you would like to know about this set, I will also be available to answer those question.